Pork ‘N Pine delivers a carnivore’s Christmas. Above: Have you been nice enough this year to deserve a bicycling Santa who brings a Douglas Fir, a pulled pork sandwich and Mariah Carey to your doorstep? The Christmas spirit takes some odd forms in Baltimore. 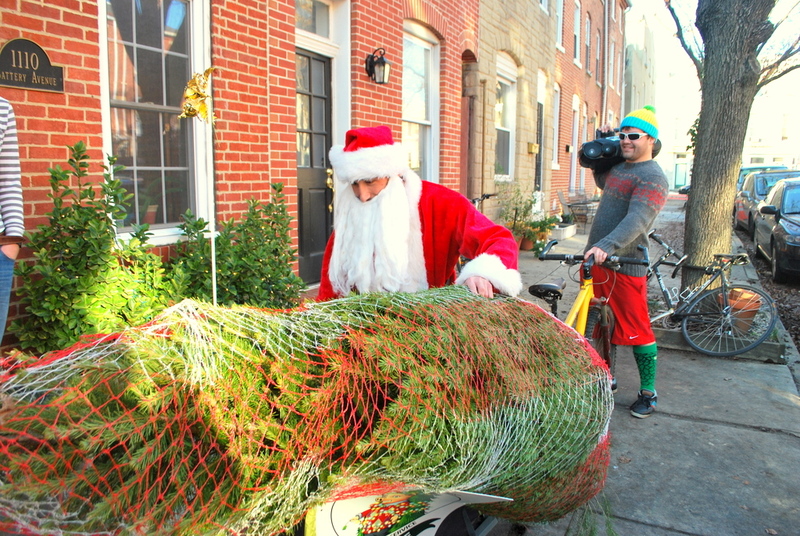 This year you may see it biking through rowhouse neighborhoods in a Santa costume with a small tree in tow, ensconced in the heady scent of slow-cooked pork. What is Santa doing delivering a tree from a bicycle, you ask, and why is he throwing in a pulled pork sandwich? Why, it’s a Christmas miracle! Otherwise known as Pork ‘N Pine, a business started by a 29-year-old Federal Hill man named Jason Toraldo. He charges $45 for the package. Jovial is perhaps the best way to describe Toraldo, whose day-job is outreach coordinator for the Johns Hopkins-affiliated Center for Talented Youth. Where others might have considered the idea, then rolled over in bed and forgotten it, Toraldo saw the opportunity to combine two great things – Christmas trees and drippy hot-meat sandwiches – and followed through. I joined “Toraldo Claus” yesterday as he biked up to four customers’ doors, a tree in tow and holiday tunes blaring out of an old boom box. Though he has his own beard, his Santa outfit is topped off by a flowing white wizard’s beard, which occasionally obscures his vision on windy deliveries. He and his housemate, Bart Viguers, wrestled a tree from his backyard and positioned it on a small detachable trailer behind his mountain bike. “It’s hilarious, but also a lot of fun,” says Dan Kestler, who also lives with Toraldo. The housemates were joined by a friend, Laura Ford, who Toraldo credits with much of his advertising strategy. The five of us mounted our bicycles on the sunny afternoon and took off in search of a nearby customer’s home. We stopped briefly to adjust the tree and deal with some major “tire-rubbage.” We also decided to change the music before we arrived at the Federal Hill home of Ellie Cochran and Greg Merboth. Mariah Carey’s “All I Want For Christmas Is You” seemed fitting. They greeted the delivery with broad smiles. “I saw him riding his bike last weekend,” said Cochran, who seemed delighted that music came with the unique door-to-door service. “It was also cheaper than getting it from the Little League field like we did last year,” said Merboth, who had heard about Pork ‘N Pine via the internet community Reddit. He and others may have discovered Pork ‘N Pine online, but the five us pedaling through Federal Hill served as a much more unique form of publicity. Many passersby stopped and stared. Toraldo knew what to do. He hailed them all with a hearty “Ho-ho-ho, Merry Christmas” and kept on rolling.